The great comedian and musician, Tani Kei, passed away on September 11 at the age of 78. He fell down the stairs in his home, hit his head, and died of a cerebral contusion. I, like most older fans of Japanese cinema, grew up seeing the films that were available on film in the United States at the time. These were the classics of Kurosawa, Ozu and Mizoguchi, or the New Wave films of Oshima or Imamura. But there were few comedies. Comedies seemingly did not fit the image of Japan or its cinema that gatekeepers such as critics or film festivals used to single out works to introduce abroad. This also tied into the horribly false stereotype at the time that the Japanese are not a humorous people. So one of my revelations when I finally went to Japan was the wonderfully rich - and of course hilarious - history of Japanese film comedy. One of the first comedy series I watched was the "Musekinin" (Irresponsible) series featuring the Crazy Cats. The Crazy Cats were a comedy jazz band led by Hana Hajime and featuring Ueki Hitoshi. Their films, produced at Toho, were usually salaryman comedies in which Ueki played a charming, slick, cunning, irresponsible, but still lovable salaryman who uses every trick to advance in the company. Hana usually played a flustered company director, and the other Crazy Cats (Inuzuka Hiroshi, Sakurai Senri, Yasuda Shin, and Ishibashi Eetaro) played various small salaryman roles. But Tani Kei was always there in a crucial part. If Ueki was the fantasy figure, the one you wished you were like, and Hana was the big, blustering, incompetent fool whom you sometimes end up being, Tani, with his roundish face and small figure, was down-to-earth, somewhat slow and silly, blinking his eyes when things were going by too fast - the one you felt most comfortable with. He was always one of my favorites. The Crazy Cats were central to the development of Japanese comedy. Although their later films lost their critical edge, the first ones were a delicious stab at the corporate structure at a time Japan was starting its period of high economic growth. The comic lyrics for their songs, by the way, were written by Aoshima Yukio, who was later governor of Tokyo. Tani, whose real name was Watanabe Yasuo, was born in Tokyo in 1932, but lived in Hiroshima and Yokohama before attending middle school in Zushi. There he started playing the trombone. After WWII, while attending Chuo University, he played in jazz bands performing for American soldiers. His comic antics garnered attention and he joined first the Sharps and Flats and then the City Slickers, which was led by Frankie Sakai, another great Japanese comedian and actor. Along the way, he created the stage name Tani Kei (谷啓), which was a brilliant pun on the name Danny Kaye (I've admired him ever since I saw that name). Eventually, Hana Hajime spotted him and he joined the Crazy Cats in 1956. He rose to fame with the Crazy Cats not only in film and song, but also on TV. Their "Shabondama Holiday" was one of the highest rated TV shows in the 1960s, and it was there he made a big hit with a silly gesture gag where he moved his right hand as he uttered the nonsense word "Gachon!" Kids around the country were imitating it. 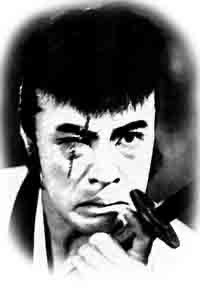 In the mid-1960s, he started starring in movies on his own, and later played such important characters as Sasaki, one of Hama-chan's bosses in the Free and Easy (Tsuri baka nisshi) series. He also was prominent on TV until the end, both in TV dramas and in comedy variety. He did the voice of Charlie Brown in Japan and I remember him especially as a regular (still playing his trombone) on Utchan Nanchan's "Warai inu no boken" series. He was the last of the main members of the Crazy Cats. A lovable and brilliant entertainer. He will be sorely missed.